Yes, a our purple friend is coming to roost. The above is a digital mock-up of Pepe Ozan’s, ‘Dreamer’, in Golden Gate Park. The actual installation will be slightly closer to the road, the head a more face-forward orientation. Pepe Ozan’s, ‘Dreamer’, originally created for Burning Man 2005, will soon be installed for a 6 month temporary exhibition in Golden Gate Park. 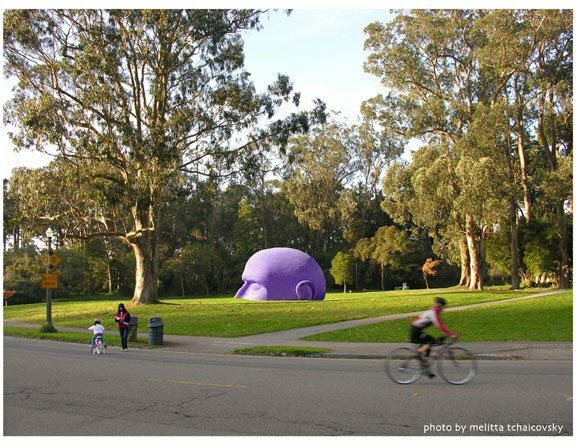 The ‘Giant Purple Head’, as it is known in several circles, made the long haul down from Reno, NV, just yesterday, will be refurbished over the course of this week, with installation expected to be complete before the weekend. This is not Pepe’s first installation in San Francisco. ‘Invocation’, a public sculpture by Pepe Ozan, assisted by Morgan Raimond, sits at the little park on Cesar Chavez St., between Vermont St. and the 101 North entry ramp. The piece is representative of an Eagle-Warrior. Aztec eagle warriors were, like the jaguar warriors, members of nobility. Their elaborate costumes were worn as a testament to the wearer’s strength and importance in Aztec society. The ‘Dreamer’ will occupy a space across from the De Young, just west of the Rose Garden in Golden Gate Park along JFK Drive between the 10th Avenue and Park Presidio entrances. An opening dedication for ‘our purple friend’ is in the works, with particulars coming your way soon.